Do you have an Erdős number? 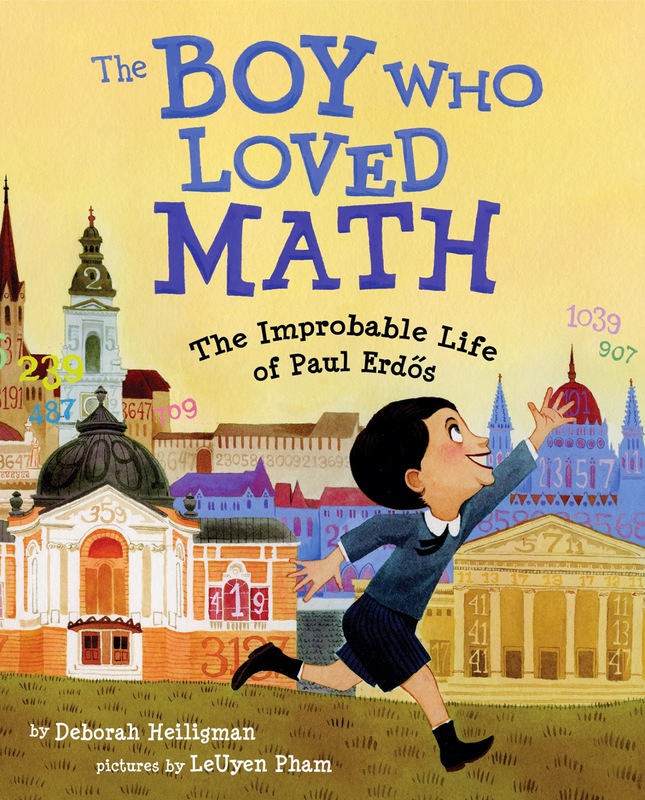 Whether or not you do, you're going to love reading this picture book biography of mathematician Paul Erdős. Heiligman balances detail and overview in the text, making the story accessible to the very young and interesting to readers of all ages. Heiligman chronicles Paul Erdős's life with humor, heart, and perfect pace, and asks the interesting questions: why did his mom let him stay home from school? How did he manage to do so much math? Why did people love him, even though he was a horrible house-guest? How do we benefit from his work, and what can we learn from his life? LeUyen Pham illustrates with eye-catching color and mind-boggling detail (just read her end-note!). She depicts not only Paul's math friends -- the number line, the hundreds chart, and many more numbers, proofs and so on -- but also the people and scenery which surrounded him from childhood into old age. The odds are good that you will love The Boy Who Loved Math. I think that more than just a "certain subset" would become totally engaged by The Boy Who Loved Math. I mean, I think it is a book you could read aloud to a class K-6 and they would be interested and engaged. I haven't tested this personally, but it has lots of good going for it: Bold illustrations that are going to look good from a distance, but are also detailed enough to be interesting to older readers up close (and did you read the illustrator's note?! I had to go back and read the whole book again; it's like the bonus pages in an I Spy book or something. There is so much cool stuff in there!) Plus also the story and language are straightforward -- again, going to appeal to a wide range. 1. Who was this person? 2. Why were they important when they were alive/in their own context? 3. Why are they important to me now? All of the PB bios I read did well on questions 1 and 2, but only a handful passed question 3 (some didn't address it until the afterward notes). I think that answering question 3 is crucial for a good bio. The answer doesn't have to be rammed down one's throat, but it's gotta be there, otherwise readers are just like "Well, that was nice. Next!" I got (#2) that he was doing tons of math, original math that was advancing the field, AND that he was collaborating with other mathematicians AND that he was encouraging them to collaborate with others. In what other picture book biography did I learn three things that the subject was important for in their own time? I got (#3) that he was important to me now because his math is being used in computers and [search engines] ... BUT ALSO I know that Paul Erdős was kind of weird! Like he couldn't do stuff that I can do and I am a kindergartner (butter bread, open milk)! He was smart but he was flawed and I know I'm flawed. And I'm kind of worried about that. But look! People loved him anyway! So this book shows me (without ever forcing it down my throat) that firstly it is okay to be weird and secondly, it is okay to be nice to people who are weird. So. That's why I think The Boy Who Loved Math will appeal to more than just a certain subset. Because we're all human. After I said all that, I knew that I really loved this book. If that hadn't cinched it, then I probably could've figured out that I loved it because I read it aloud to my husband late at night, my kids after school, and I even read it to my mom over the telephone. Yep. Also I ended up taking the author's recommendation and watching the documentary about Erdős' life, N is a Number. So. Check it out! Buy a copy! Buy copies for your friends! It's a great book. If you buy from Barnes & Noble or from Amazon I can get a small commission from the sale.